1. Spray a little olive oil into a medium sized pan. Place over medium heat, add mushrooms, then cover and cook for about one minute, stirring occasionally. 2. Reduce heat and gradually stir in the mint sauce and yogurt. Cook gently to heat through thoroughly. 3. Spray a little olive oil into a non-stick frying pan, place over medium heat, and then cook tomato slices for about 2 minutes, turning over halfway through cooking. 4. 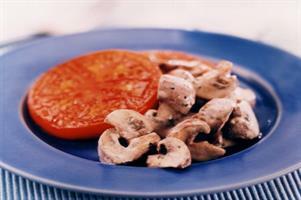 Serve tomato slices on warm plates with mushrooms spooned over the top.